Coupled to other elementary excitations, such as phonons and excitons, the surface plasmons open new ways in terms of spatial and spectral control of the local electromagnetic field. Indeed, new hybrid plasphonics and plexitonics excitations come out when the optical resonances are fine tuned to form mixed optical states. Such situations are encountered in plasmonic resonators supported by optically active substrates thus leading to Fano interferences or to mixed Rabi states. 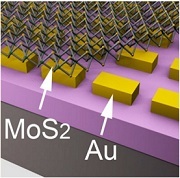 The plasmonic nanostructures can also support active nanostructures such as the layered transition metal dichalcogenides known for their exceptional optical properties. Applications are targeted in the fields of telecommunication (highly sensitive photodetector), energy (hydrogen production by photo-catalysis) and water purification (photo-degradation of pollutants).